In Episode 037, we discussed the power of routines in your day, and specifically, your morning routine. 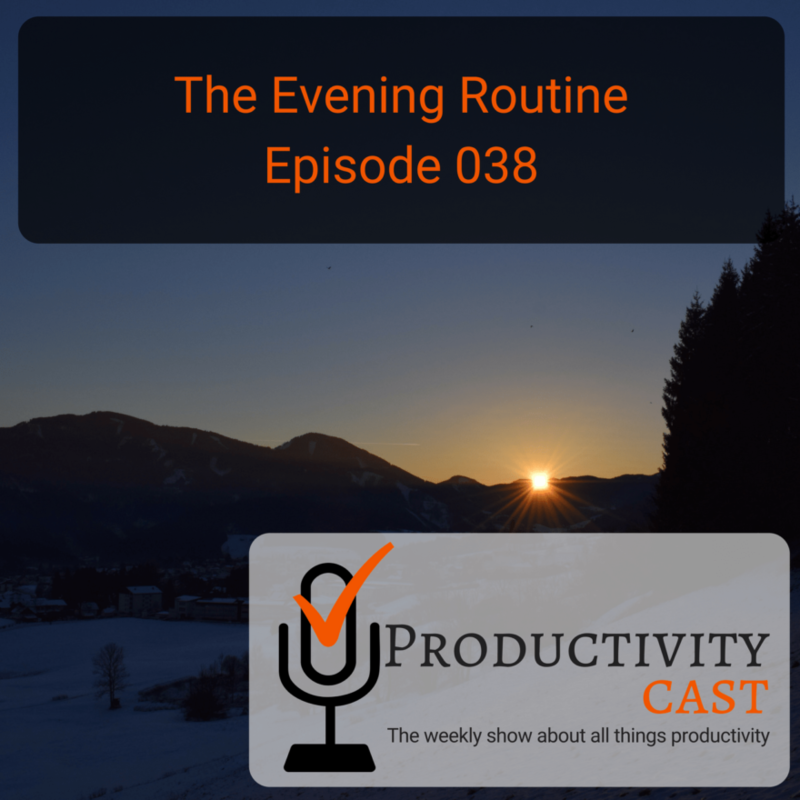 In this episode, we cover the evening routine and how to make your evening routine a productivity enabler in your life. Are you ready to manage your work and personal world better to live a fulfilling, productive life? Then you’ve come to the right place productivity cast, the weekly show about all things productivity, here are your hosts, Ray Sidney-Smith and Augusto Pinaud with Francis Wade and Art Gelwicks. Welcome back everybody to productivity cast the weekly show about all things productivity. I’m recently Smith and I’m joined here today with my co host Augusto Pinaud how’s it going? it’s going awesome. Good morning. How are you today? Good day. routine for me what it sounds like, Good advice for listeners is that those who do, you know, start their day, really strong and early, more systems, more ways in which to benefit your future self in the day is going to be helpful to you, right, the more structure as you lose capacities and your energy, you know, just basically energy for the day, you need to make sure that you have kind of things put into place so that you can have a well worn path in that routine, you probably know about decision fatigue. my my morning routine is superstructure. Okay? I tend to write on the journal I tend to tend to write them on my journal, I tend to prevent review my goals and I do that every morning pan. And the reason I do that every morning is because allow me to set direction you know, it is as Francis was saying, at that time, I tend to have the the strongest wheel and as the day progress that tends to go downhill. So reviewing the direction that I’m taking in the morning allow me to make better calls and better decisions as today progress so for that reason I checked them daily so that’s part of why I get quiet time I get prayer time those are things that are part of of my morning routine but he’s pretty strict on pretty rigid if you may, okay I need that that time of reflection of making sure things I that I’m preparing for the day after that’s up then I go to to work and to do things then I start interacting with with the world I usually do not interact with the world on tool I have half that morning check copper teen done on my night routine. It usually happen I have kids I so it’s usually after kids are to bed, it basically goes into closure today. So I go and again review my goals. Why? Well, because he I like to go and shut down with the idea of knowing where I’m trying to go. So that’s that’s the second thing I do. And then I try to look at that time I am you know that that laid guy. So for many, many years, I used to joke that I belong to the our club. And I was a guy who was fake up on till really late. And at some point I discover that if instead of staying on till really late, I go to bed early and wake up earlier than everybody and get quiet time. So I tried to wake up around 430 in the morning, what was going to do I was going to be able to do in that hour and a half before the world is up and before the people is interacting in many cases, I’m able to accomplish more than what I can accomplish on the next four. So because of that I try to get into that early time and do only super high impact things. Okay, that’s another time to check Facebook. That’s not the time to that’s the time of doing tasks that are high impact task. And then but I planned them at night before before I go to bed. You know, I don’t negotiate with myself. My wake up time in the morning. I do that at night at night. I am a pretty reasonable guy in the morning when the alarm sound I am not therefore I do my best to plan that time of what time I’m going to wake up and what is what I’m going to do at night and not in the morning when I wake up. the alarms by the way from the wrist instead of the phone. The other thing I discover is I know what the alarm comes but then nobody else now so indicates my wife who gets you know, frustrated with me having so many things that are talking about Arsenal that that works really, really well for both because then she don’t get frustrated about it. I knew that I’ve benefited from that I have I have a warehouse watch myself the the Huawei original smartwatch and it is fantastic for being able to silence So there’s a setting in it. And there may be the same thing on the on the Apple Watch. But there’s a setting that basically says when I’m connected to my phone, then mute all the notifications on the phone itself and provide those to the watch. And so on the watch I have the notifications that to vibrate. So now instead of audible tones, I’m just getting a little buzz on my wrist and that’s alerting me as opposed to being you know, the reflex action which is to hear a sound and you know Pavlovian you know, jumping to it. It’s like, okay, there’s a, there’s a buzz, I can either choose to look at the screen or not. But it’s not it’s not as distracting for me. And certainly it’s not making a sound that’s going to bother others around me, especially if I’m you know, working giving a workshop or seminar or whatever i’m i’m usually tracking my time for different portions of the of a of a workshop, especially on my watch, so that I don’t have to have my phone in hand which is you know, somewhat disruptive to people who you know if I’m on if I’m up in front of people. So the watch is extremely helpful for so many different things that I know it’s not smart watches are not for everybody. But being a watch were in the first place. The smartwatch was a natural extension. And it certainly helps to have those kinds of alarms right there on you. So I appreciate that the gusto and Francis you might want to check that out. plan the next day, read your goals, reflect and or pray, set things out for tomorrow, have family time, it says say personal conviction, and then unleash your imagination. So I like the idea of some of these being moved, you know, into your evening hours, especially when we know that when, when we feel confident of energy, that’s actually a very creative time for us. So we are capable of doing more creative stuff. So this is where, like, avoid randomness is actually like, in in control prediction to the idea of being using our imagination and being creative. Because to some extent, you know, creativity is, is that chaotic part of our, our being, but it’s also pattern recognition. So, you know, while things may seem chaotic on the outside, they may not be, you know, underneath the hood. But anyway, the point is, is that I think it’s a good article to kind of get you thinking about the various aspects of it. But I certainly like the idea of eliminating negativity, doing things that you enjoy doing in the evenings, if that’s your personal time. And, and planning the next day, and putting things out for the next day. Because you really save yourself a lot of effort, if you can set yourself up for the following day. in this sort of nonlinear, relaxed brain, not making lots of effort kind of mold, your brain breaks out of this sort of linear step by step pattern that I described earlier, in terms of what’s happening and morning. And it allows the brain to sort of roam free, and it’s in the roaming free that the best ideas come. And that tends to happen between six and nine or sometime in the evening, however, that you can’t quite program and plan them, I can’t, I don’t know how to do, you know, program, that kind of serendipitous insight. And I need to do the background because without the background stuff, I can’t have that kind of leap of logic or that creative burst. But I need to sort of not exhaust myself totally, because it doesn’t happen, then that I’m too tired to have it happen. So I sort of need to create time in the evening where I’m not too tired. But I’m just tired enough to break out of sort of the regular way of thinking. And then I can get hit by an idea. And I know it happens, like I said, I can’t quite program it, but I can at least allow for it on a regular basis. If I solo create the conditions for it, then maybe 10% of the time, I’ll actually have something, you know, like a nice a nice insight that I’ve never had before. So I think there’s some, there’s some validity to it in my experience. that’s it for this productivity. Cast the weekly show about all things productivity with your host Ray Sidney-Smith and Augusto Pinaud with Francis Wade and Art Gelwicks.